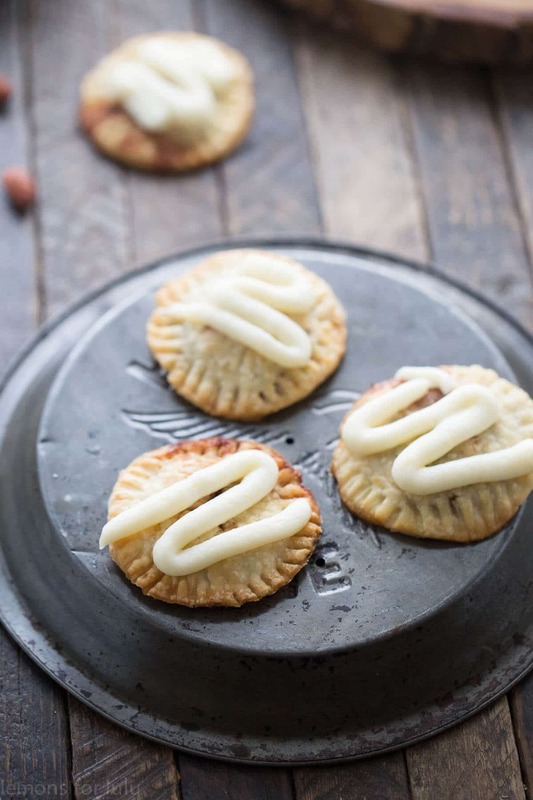 Easy Cinnamon Rolls Hand Pies – Pie dough surrounds a sweet cinnamon and nut filling, then topped with a cream cheese topping. These easy cinnamon rolls hand pies are portable little treats! 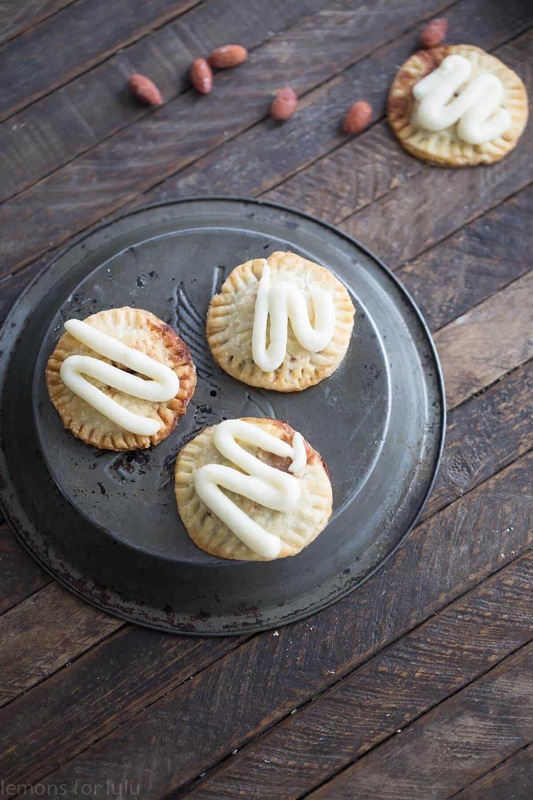 These easy cinnamon rolls hand pies are perfect for the day after Mother’s Day. I am guilty of featuring fancy pant desserts in the days leading up mom’s big day. 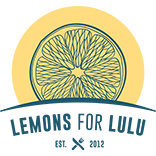 I’ve shared a Mimosa Bundt Cake, a Hummingbird Coffee Cake, and Key Lime Waffles in the hopes of inspiring us to treat mom to something as special and sweet she is. But here we are the day after Mother’s Day, and we have forgotten all our praises and declarations of love and have gone back to our usual ways. There are no more special breakfasts or lunches. Mom is back to cooking and cleaning just as she was on the day before Mother’s Day. Buttery and flaky pie dough is shaped into sweet mini hand pies and filled with homemade lemon curd! Perfect little bite sized desserts! It doesn’t have to be that way. 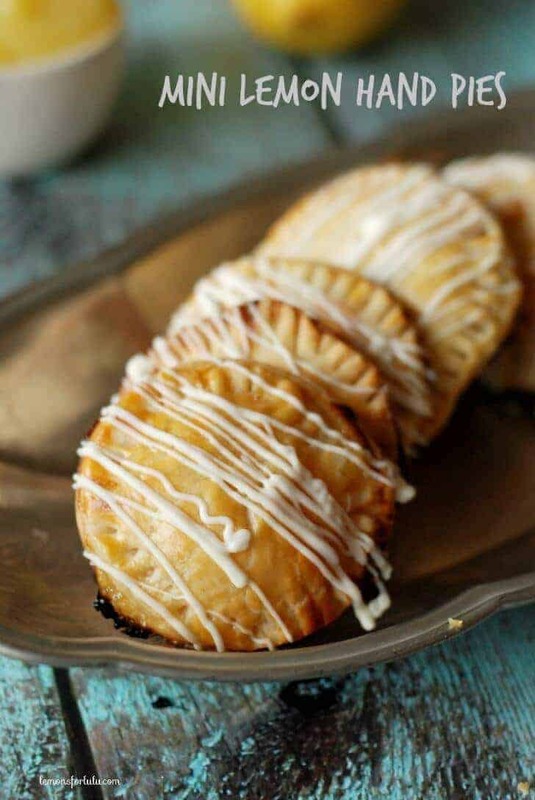 If you made these easy cinnamon rolls hand pies, then mom could munch on them with her coffee today, tomorrow and the next day. They are the gift that keeps on giving. 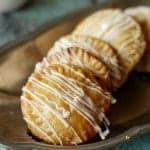 The method for this recipe comes from my lemon hand pies. They do take planning, as the dough needs to be chilled (15 minutes is all). However, since you are using store bought pie crust, the entire recipe is a snap to prepare. My filling is a creamy blend of butter, brown sugar, cinnamon and Blue Diamond Honey Roasted Almonds. 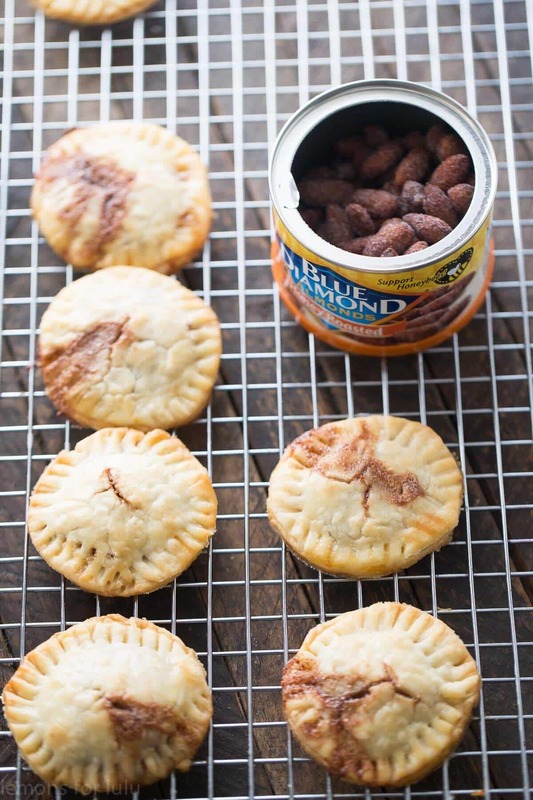 The almonds add crunch and deep, naturally sweet flavor. The cream cheese icing is tangy enough to balance out that sweet, cinnamon filling. There you have it; an easy cinnamon rolls recipe that will compliment your morning coffee, top off your evening meal or satisfy your sweet tooth at any moment in between. 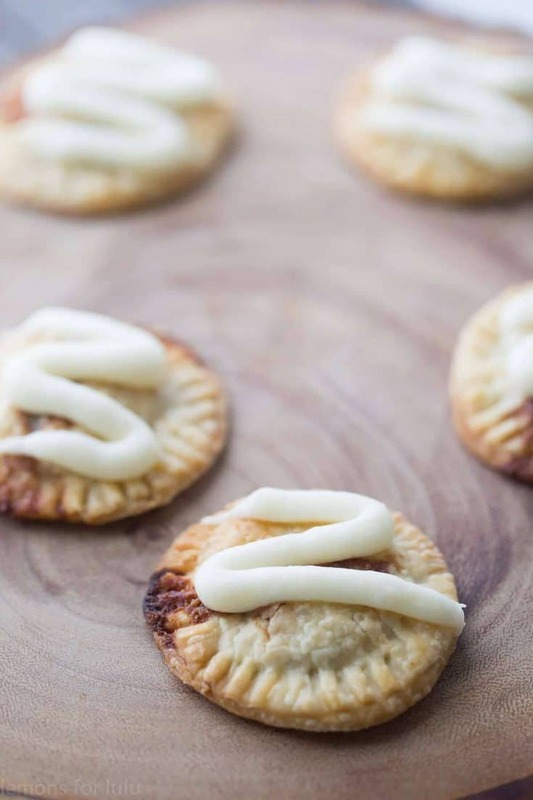 Pie dough surrounds a sweet cinnamon and nut filling, then topped with a cream cheese topping. 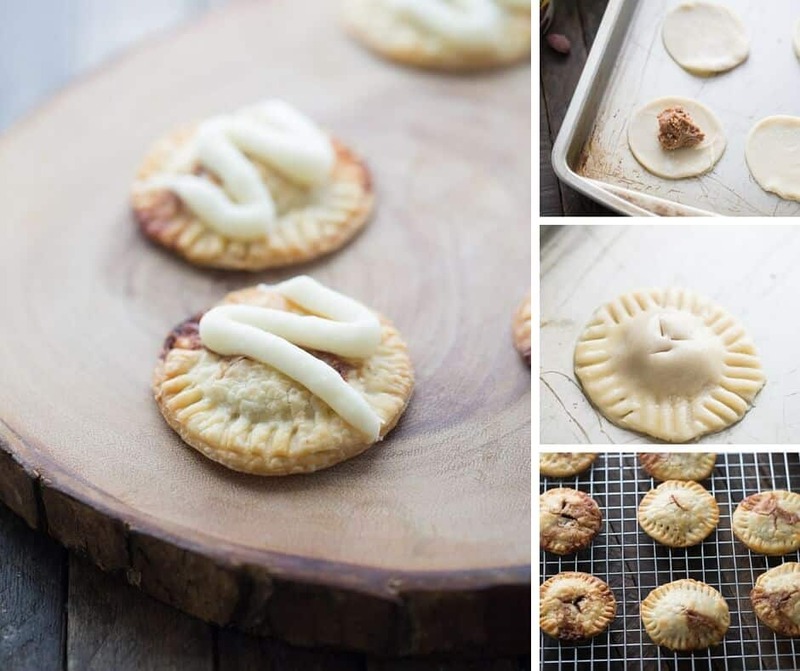 These easy cinnamon rolls hand pies are portable little treats! Bring pie crusts to room temperature. Unroll one pie crust on a floured surface. Using a 3’ biscuit cutter (or a juice glass) cut crust into circles and place dough on a cookie tray. You should get about 10-12 circles. Repeat with remaining piecrust. Place trays of dough in the refrigerator to chill about for 15 minutes. Combine the butter, brown sugar, cinnamon and nuts in small bowl. Preheat oven to 425. Prepare egg wash by lightly beating together the egg and the water. Remove dough from refrigerator and place a teaspoon of the filling onto the center of one tray of dough. Brush edges with egg wash and place circles from the second tray over each cinnamon topped pie. Using a fork, crimp the edges to seal the pies. Generously brush the tops of each pie with remaining egg wash. Using a pairing knife, carefully cut 3 slits onto the tops of each pie. Bake pies for 12-15 minutes or until golden. Let cool completely. 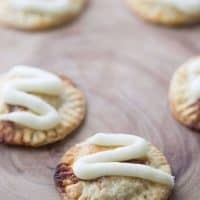 In a small bowl, whisk together butter, cream cheese, powdered sugar, vanilla and milk and drizzle over cooled hand pies. These are so cute! I love those Honey Roasted Almonds! These are so sweet and easy! What a great little treat! Love this creative twist on cinnamon rolls so much! What a great idea! These hand pies are too cute. Perfect for satisfying any sweet tooth craving! Those almonds sound scrumptious! I’d love one (or two) of these. Love the idea of a cinnamon role pie! I just picked up some of those almonds and I’m super excited to try them. These pies are too cute. These look so delicious! I definitely want to try these out… I have a small obsession with cinnamon rolls and the like. Can I use walnuts instead?